HomeResourcesRequest Routing for TV CDNs: HTTP or DNS-based? 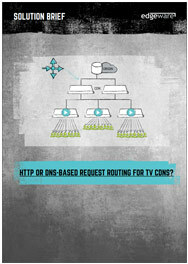 Solution Brief Request Routing for TV CDNs: HTTP or DNS-based? A content delivery network (CDN) needs to understand which server is best used to deliver different content to different users or client devices. There are many factors the CDN needs to consider when choosing which server the request should be routed to. This function is called request routing. In this Solution Brief we will discuss two alternatives: DNS-based and HTTP-based request routing. What are the differences and which alternative is best if you want to deliver a scalable and amazing viewing experience, and utilize your storage resources efficiently? Download this solution brief to find out.